Join TADL for a special reveal and opening of the Preschool Interactive Learning Area! This event will be held prior to the weekly StoryBag Stories program at 11:00 a.m. Visitors over the past few weeks may have noticed the middle bay area in the Youth Services department, at the Main Library, has been partially enclosed with plywood walls. As the custom millwork is completed on each element and artist Glenn Wolff puts the finishing touches on the murals, we’re keeping most of this project under-wraps until the entire project is completed. 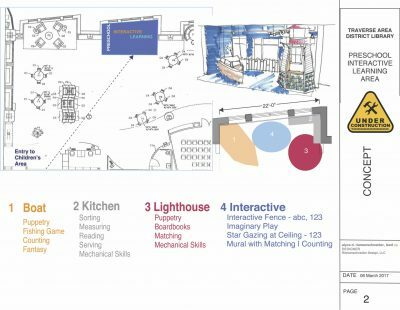 This third phase of the Youth Services redesign effort, initiated in 2015, the Preschool Interactive Learning Area (PILA) integrates classic children’s literature themes within play spaces which foster interaction to increase childhood literacy. Each element of the area has been designed to allow children to use their creativity while developing their imagination and dexterity, as well as physical, cognitive, and emotional strength. 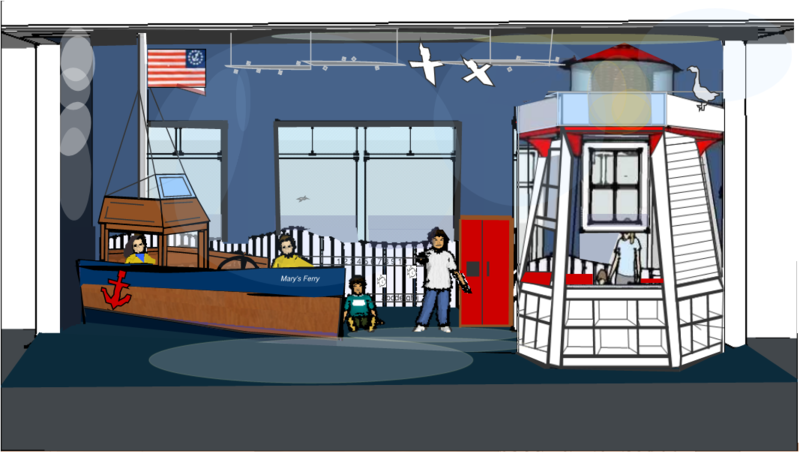 The design includes many of the much-loved elements from the Youth Services department reimagined, including a new boat and a puppetry window integrated into the lighthouse. Board books will be stored within shelves built into the lighthouse base. A play kitchen area allows for children to learn sorting, measuring, serving and fine motor skills. The PILA project has been funded primarily by a bequest from William Engle who passed away in July 2016, with additional funds raised through our Raising Future Readers event (April 2017) and donations from Sally Hanley and the nonprofit Pour for More. We are grateful for all of the support we have received for this project, and know that this specially designed area for our youngest patrons will be loved and well used for many years to come.